THIS BOWL! Omg. 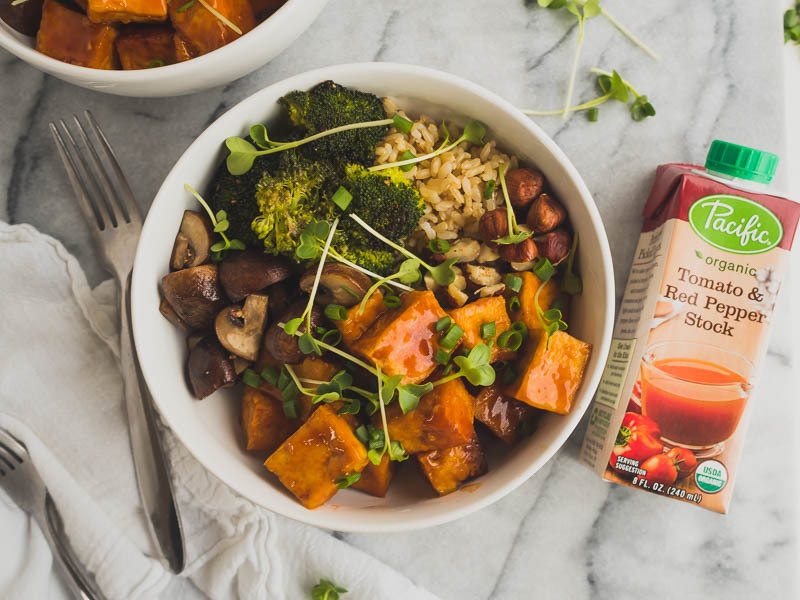 Let me introduce you all to Pacific Foods newest (uhmazing) broth: Organic Tomato & Red Pepper Stock. It’s vegan! It’s tasty! And it’s gonna make a glaze for this tofu that is out.of.this.WORLD! 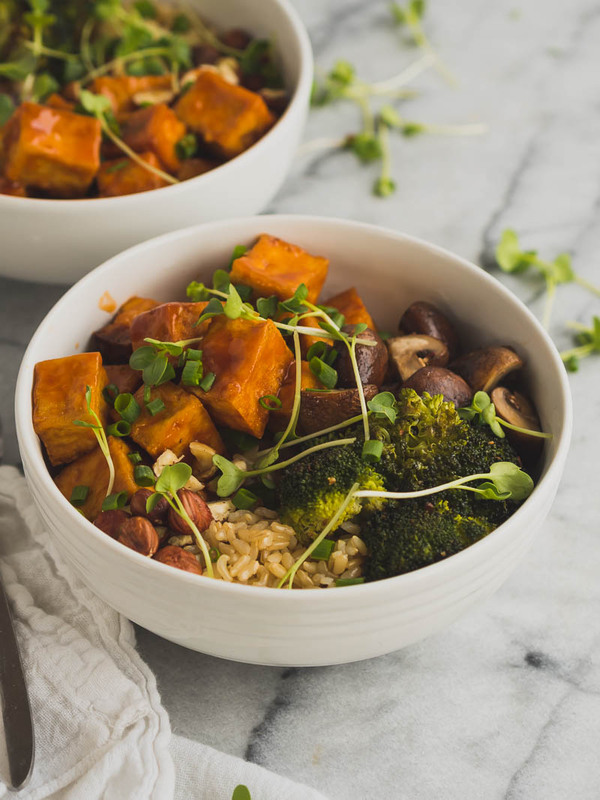 I’m so glad bowls are having a moment: they’re so easy, customizable, healthy (well, that’s up to you and what you put in them! ), and PRETTY! I’m a fan. 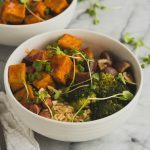 This recipe is really all about the tofu — you can swap out whatever grain/grain-alternative/whatever as the base of this bowl, and use any other veggies you want. I’ll include what I used in there recipe here, but — as I usually say — you do you! Get creative! But first, back to the tofu. 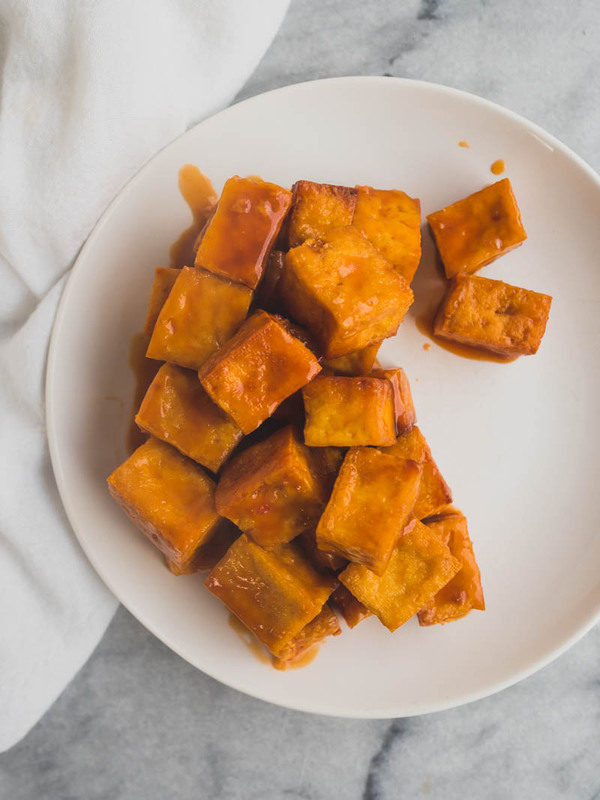 I have 3 major rules for tofu: 1) Drain it, 2) fry it, 3) flavor it. Step one just requires a little bit of cutting (and the right kind of tofu: extra firm NOT SILKEN), then I lay my tofu slabs flat on a baking sheet, with a dish towel both under and over the tofu. Cover that with another baking sheet weighted with cookbooks, and let it drain for 20ish minutes. Step one, done! Step two: fry it. This basically makes it into a sponge, IMO, to soak up all of the flavor that are coming next. I use about 1/4-1/2 inch of oil (whatever you prefer) and fry my tofu cubes until they’re golden brown on each side. It’s pretty quick and easy, and the word “frying” doesn’t need to scare you away here! Step three: SAUCE. Mix up all the amazing sauce ingredients, cook them into a thick glaze, then add the tofu back in. It’ll soak up some of the sauce, and be a great vehicle for more of it. Then, just assemble your bowl! Voilà! 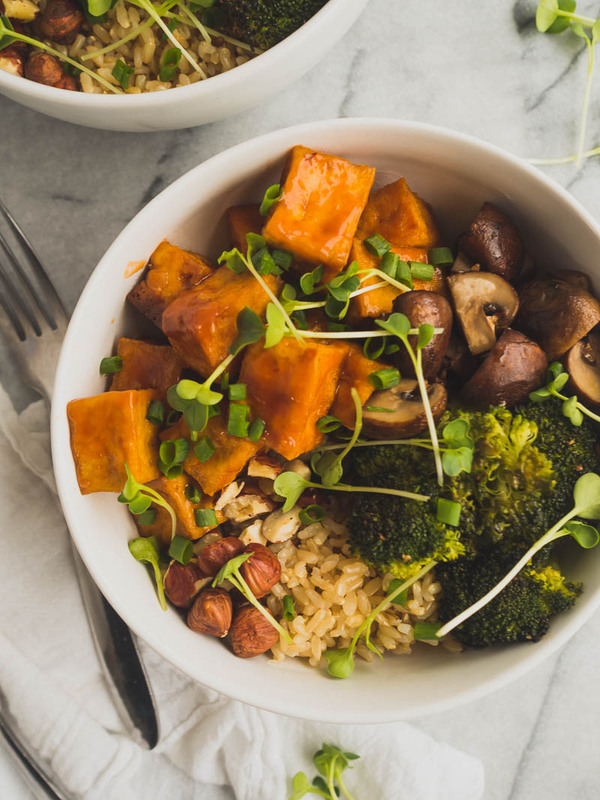 This vegan tofu bowl has fried tofu coated in a spicy red pepper sauce. It’s delicious, healthy, customizable, and easy to make. After my best friend suggested that I be vegan, find good vegan food was always hard. I never really knew how exactly to make a good vegan food and this taught me just that.